The Karikari Kitefishing Klassic annual kite fishing contest has begun and it looks like all the action will be on the east coast this year. The contest runs for three days, the 2nd, 3rd and 4th of December. Today looks great and tomorrow should be fishable, although by late afternoon those with specialist light wind kites will have an advantage. If the forecast for Saturday is correct launching a kite will be very tricky. 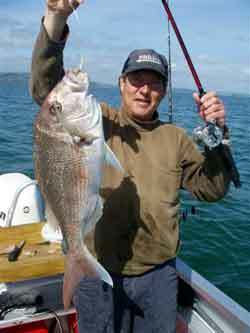 Terry Goodfellow caught this five pounder (pic above) and 17 others in 17 meters of water out from Kawakawa Bay on his Paul's Fishing kites boat setline. The fish are desperate to get caught at the moment. We got this one on a rusty old Jap hook (with target wire of course) Sent this in for Rob at the shop, he wanted a photo of one straight out of the water. The catch in the pic above right was a bit 'hard case'. We had set the long line and caught a few pan sized snapper on it, then decided to have a rod fish. The hooks on my rod weren't too good so I borrowed two target hooks from my set line box and fashioned a ledger rig out them. After a couple of 30cm fish, this 5 pounder jumped on. It looks much bigger. He just couldn't resist those set line hooks. Photo above : And here is another one caught on the set line still in the water, ready to be hauled aboard, and put into the chilly bin. Photo above right : I also went over the Manukau bar on the 10th November to find a mega red with my Paul's Fishing Kites boat longline. We didn't get the "big one" but still finished up with 10 snapper including this five pounder and 10 big gurnard. 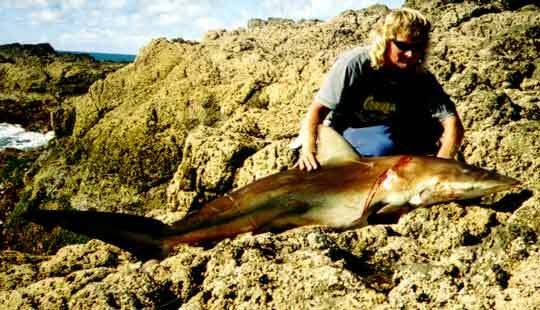 This is an old report, but shows just what can be caught from the shore with kites. My kite fishing system uses two rods. One with the casting kite and 20 to 30 metres of 80 lb line down to a swivel, with 15 kg mainline, a plastic breakaway clip was attached to the kite rig using a piece of 15 kg line. A nice big piece of tuna was attached to a steel trace and then attached to 8 metres of 400 lb mono, just in case of big Mako's rolling up the line. A glitter bird was attached as well. The reel for the bait outfit was a Penn 80TW with 1000 metres of 37 kg, a no nonsense set-up capable of landing just about anything. Land based fishing is a lot of fun. There are a lot of big fish in close to shore at certain times of the year, and with the right gear, you have got a good chance of landing anything that comes you way. Look forward to my new kite up at Lottin Point this March, who knows what will happen? Went to Muriwai on the 14th November with our big Paul's Fishing Kites dropper rig and set it out twice with 16 hooks baited with kahawai and mackerel. The wind was a moderate northerly, the surf slight and the tide was dropping. 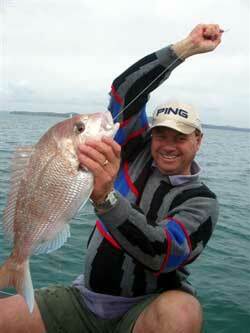 The gear didn't quite go out straight but we still caught eight snapper, two gurnard and a kahawai. The two biggest snapper weighed in at 14 and 15 pounds. We had an four engine Air force Hercules 130 aircraft crash into our kite at Te Arai Point on Thursday while they were doing low flying missile evasion manoeuvres. We rang the Air Force when we got home and apparently they saw the kite at the last minute and tried to avoid it. They informed us that they are allowed to fly as low as 100 meters and, as the kite was at 100 meters, it was simply tough luck for us! When you consider that the beach is over 5 kilometers long and they decided to do a manoeuvre directly into my kite maybe it is just unfortunate that we were kite fishing at the time. We had only just got the kite up and were still connecting the traces to to the rig when the aircraft hit. I have to admit that it was pretty amazing to see such a big plane like that flying so low. I will send some of our Te Arai photos in to you as I don't have them on a digital camera. 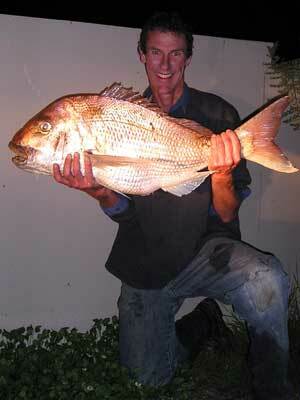 Steve Barnes caught this 12 kilogram snapper on the 4th November at Muriwai Beach. Steve drove five kilometers up from Rimmer Road and fished ten hooks per set with his Paul's Fishing Kites 65kg dropper rig. 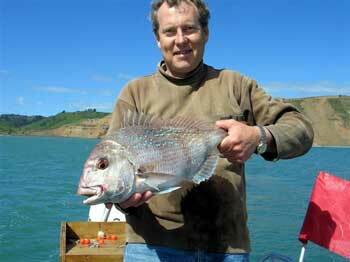 He was using freshly caught kahawai for bait and fished three sets on an outgoing tide. The winds were light, so Steve used a combination of the night hawk and sky hook kites to get enough pull to tow the big rig out. Steve caught three snapper, three gurnard and a kahawai for the day. The big snapper was taken on the last set of the day at 7.00 pm. On the 13th November the winds were moderate north easterlies and the surf was average size. We put our kite longline rig out twice with salted mullet on the 25 Target hooks we were using and the gear set straight out. It was a great day and we wound up with 12 snapper, three gurnard, nine kahawai and a shark. 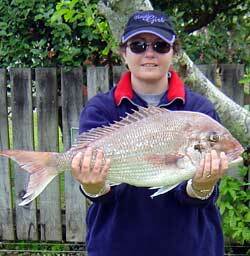 The snapper averaged around one kilogram each. There were plenty of sharks around on the day and they seemed to be only interested in the kahawai as these were the only fish mauled by them. I watched as a guy set out one of those seahorse submarines off Glinks the other day. In my opinion the gear went out way too fast and it only set to around 700 metres offshore before the battery cut out. A few minutes later the rip had dragged it back on the beach 700 metres up from where he had set it out and it was bouncing around in the surf. 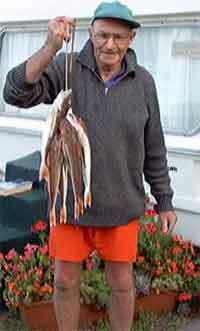 He only caught 2 gurnard. Goldie and I spent three weeks at Waihi beach in our onsite caravan and we caught 27 gurnard on both the super kite-dropper rig and the Kentiki when the wind was wrong for the kite. We found the fishing to be very poor through the day so we fished in the evening which was a whole lot better. We returned to Waihi last Monday and in the evening we caught seven gurnard from 15 hooks set. We were using the Kentiki, and we noted that six baits came back, so while this was a good day for us maybe it would have been even better if we had left it set a little longer. 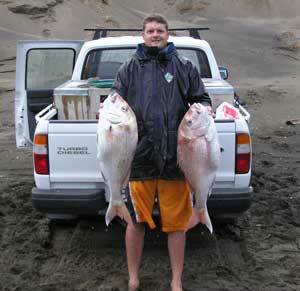 Over the past few months fishing has been hard off Waihi beach. Got this report with no name on the 14th November. 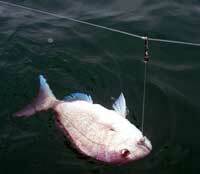 We fished the west Auckland area with a Paul's Fishing Kites dropper rig. The wind was light northeast and the surf slight. We did three 10 hook sets and fished over the high tide. We used kahawai for bait and caught three snapper three gurnard and a shark. 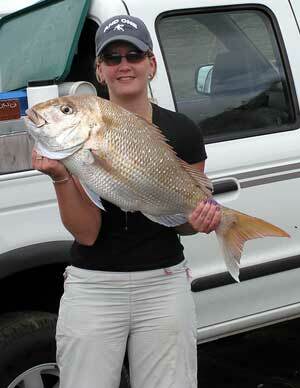 Hi, here is a shot of my wife and a 3.7 kilogram snapper she caught at Coromandel on Saturday the 6th November. She is very proud of it so I thought I would send this in to you for your website.